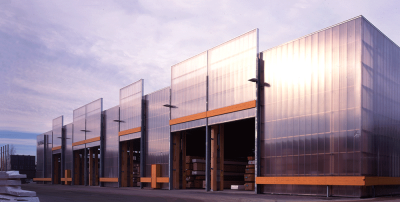 The Kaufmann Holz company needed a simple warehouse with cranes for the storage, finishing and commissioning of the glued laminate elements that it manufactures. A building with adequate simple structure and details was built under enormous time pressure in that both the design and construction was completed during the period of January to May 1999. 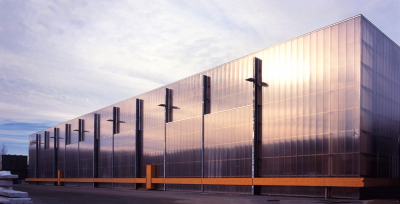 A transparent façade out of impact-resistant, full-height polycarbonate sheeting enables the warehouse interior and the production process  workers, production stages, materials, construction  to be experienced from the outside, while also allowing the surroundings to filter directly into the hall. Glued laminate battened columns, whose deep cross section creates a fixed joint, create a yoke-like two-bay hall.  The inner columns take up the load of the crane gantries and the outer columns support the loads from the roof structure. The catwalk for observation and driving of the five cranes in both bays runs through the central columns. 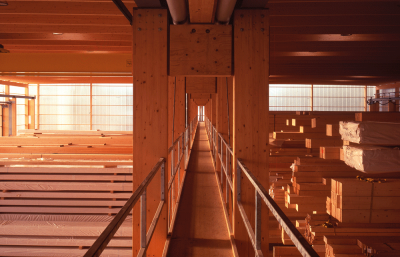 For the primary structure over the individual bays, slender glued-element beams at two-metre centres were selected. Independent of the timber structure, temporary steel platforms were installed in the area of the full-height sawing and planing machines. The resultant building is not only extremely functional but also of one piece with regard to materials, construction and detailing. 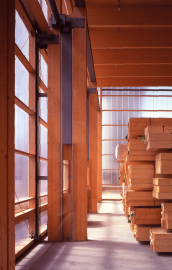 The client is satisfied both with the functioning and appearance of the building and with the corporate identity image it conveys  that is, of an innovative timber construction firm.